It is hard to believe that it is time to celebrate the New Year here in Durham! Morehead Manor Bed and Breakfast shares some opportunities for things to do on New Year’s Eve and New Year’s Day here in Durham and we also recommend our extras for a romantic night in. At Arcana (331 W. Main Street) on December 31 (from 7 pm to 2 am) celebrate the New Year with the Lynn Grissett Jazz Trio. Lynn Grissett on trumpet and saxophone, Devin Fuller on drums, and Kevin Beardsley on bass. Get ready to celebrate 2019 with us! Arcana welcomes in the New Year with one of their favorite jazz bands- the Lynn Grissett Trio! They will have drink specials available all night, as well as our favorite Blanc du Blu Cava. Doors at 7pm, music starts at 10 and goes into the New Year! $10 at the door. Celebrate the New Year with food, drinks, and dancing at Beyu Caffe (341 West Main Street). Time to push back the tables, set up the buffet, pop champagne, and let Tre King Band take control. Tre King Band is sure to Funk Up your night with their fusion of soul, funk, jazz, and R&B. This year there are two ticket types. Go VIP ($100) and get a seated ticket which comes with a seat at a table, glass of champagne for a New Year’s toast, and access to the buffet featuring Beyu Caffe signature items available from 10-11:30pm. Want to join the party but don’t plan to stop dancing? Get a Standing Room Only ($75) ticket which gets you into the party, plus champagne toast, and the Beyu Buffet while maintaining the danceable element and groove. Call (919) 683-1058 with your questions or to reserve your spot. Local 22 (2200 West Main Street, Erwin Square of Ninth Street District) offers small plates, meats, flat breads, sandwiches, and salads and this restaurant sources all its ingredients from within 30 miles of the restaurant. On New Year’s Eve they feature all your signature local offerings patrons come to love from 11am-10pm. Plus some bubbly specials, including $5 glasses of Cava! Save your seats and toast your way into 2019 with full bellies, tall pints, and good folks. Call (919) 286-9755 or make reservations online. 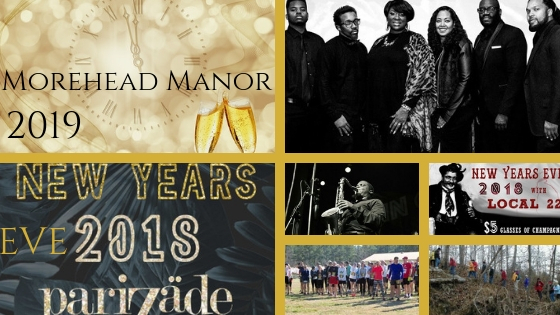 Parizade (2200 West Main Street) invites you to an elegant New Year’s Eve celebration! Celebration seating will take place between 9:15pm–9:45pm and will include a decadent 4-course prix-fixe menu with champagne toast for $90 per guest (tax & gratuity not included). They will also have Dom Perignon available by the glass all night long to send 2018 off in style and start 2019 off right. Call (919) 286-9712 to make reservations. Don’t party too hard! Durham has two New Years Day Runs! The New Years Day Run for the Duke School for Children (3716 Erwin Road) lets you start (1 pm) the New Year off on a good foot! Registration at noon. Part of the Godiva Track Club’s Winter Series. Email (webmaster@carolinagodiva.org) for more information. Each year on January 1st the Eno River Association sponsors a fun-filled afternoon of guided hikes, refreshments and merriment. Begin walking by parking lot (at 6101 Cole Mill Road) by 1:40 pm to start running at 2 pm. Hot chocolate, marshmallows, and popcorn will be served around the fire at the end of the hike. Call (919) 620-9099 to learn more. Feel like a romantic evening in? 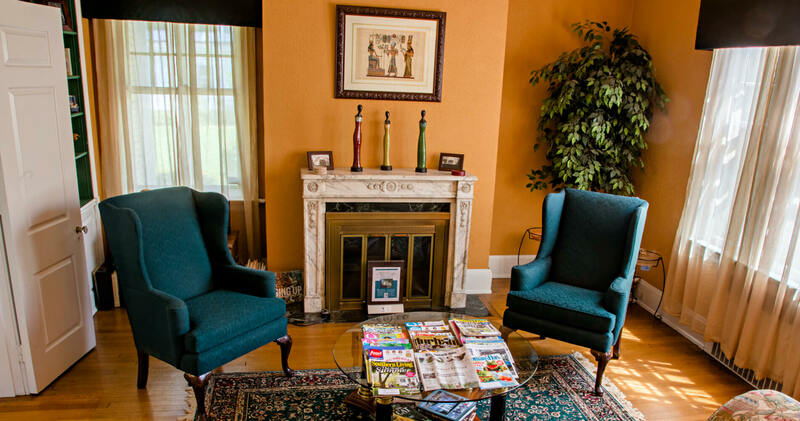 Morehead Manor Bed and Breakfast in Durham, North Carolina recommends our “Fire and Roses” Special and our Romance Packages. Our guests enjoy a delicious, complimentary gourmet breakfast each morning. This entry was posted in Events and tagged celebrate, Durham, New Year by admin. Bookmark the permalink.